Download "PRESS RELEASE. 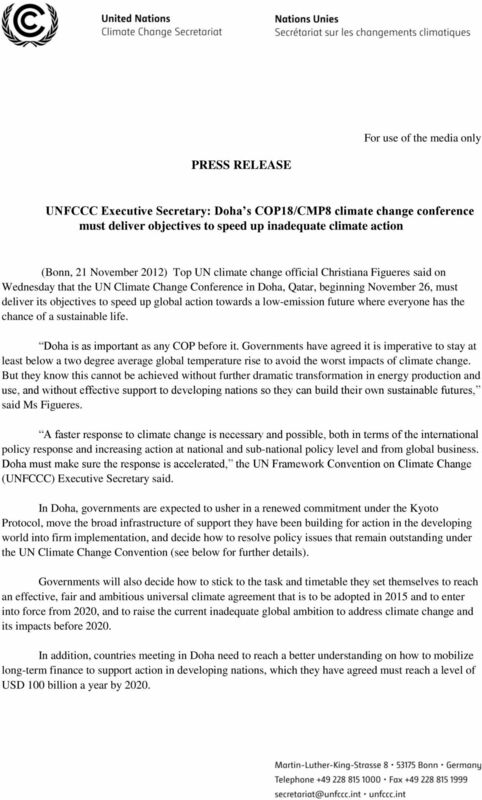 UNFCCC Executive Secretary: Doha s COP18/CMP8 climate change conference must deliver objectives to speed up inadequate climate action"
1 For use of the media only PRESS RELEASE UNFCCC Executive Secretary: Doha s COP18/CMP8 climate change conference must deliver objectives to speed up inadequate climate action (Bonn, 21 November 2012) Top UN climate change official Christiana Figueres said on Wednesday that the UN Climate Change Conference in Doha, Qatar, beginning November 26, must deliver its objectives to speed up global action towards a low-emission future where everyone has the chance of a sustainable life. Doha is as important as any COP before it. Governments have agreed it is imperative to stay at least below a two degree average global temperature rise to avoid the worst impacts of climate change. But they know this cannot be achieved without further dramatic transformation in energy production and use, and without effective support to developing nations so they can build their own sustainable futures, said Ms Figueres. A faster response to climate change is necessary and possible, both in terms of the international policy response and increasing action at national and sub-national policy level and from global business. Doha must make sure the response is accelerated, the UN Framework Convention on Climate Change (UNFCCC) Executive Secretary said. 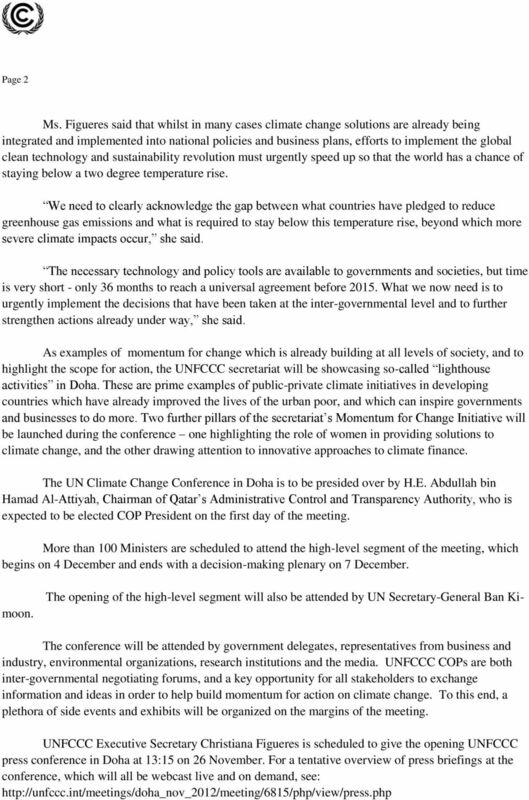 In Doha, governments are expected to usher in a renewed commitment under the Kyoto Protocol, move the broad infrastructure of support they have been building for action in the developing world into firm implementation, and decide how to resolve policy issues that remain outstanding under the UN Climate Change Convention (see below for further details). Governments will also decide how to stick to the task and timetable they set themselves to reach an effective, fair and ambitious universal climate agreement that is to be adopted in 2015 and to enter into force from 2020, and to raise the current inadequate global ambition to address climate change and its impacts before In addition, countries meeting in Doha need to reach a better understanding on how to mobilize long-term finance to support action in developing nations, which they have agreed must reach a level of USD 100 billion a year by 2020. 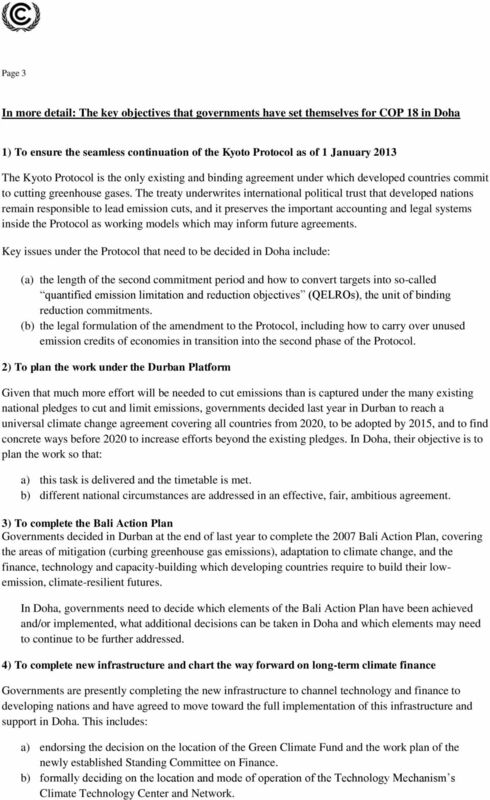 3 Page 3 In more detail: The key objectives that governments have set themselves for COP 18 in Doha 1) To ensure the seamless continuation of the Kyoto Protocol as of 1 January 2013 The Kyoto Protocol is the only existing and binding agreement under which developed countries commit to cutting greenhouse gases. The treaty underwrites international political trust that developed nations remain responsible to lead emission cuts, and it preserves the important accounting and legal systems inside the Protocol as working models which may inform future agreements. Key issues under the Protocol that need to be decided in Doha include: (a) the length of the second commitment period and how to convert targets into so-called quantified emission limitation and reduction objectives (QELROs), the unit of binding reduction commitments. 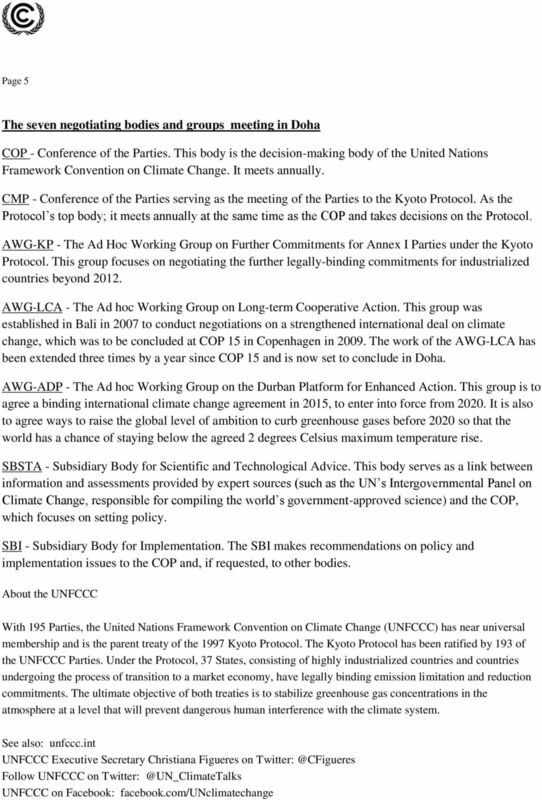 (b) the legal formulation of the amendment to the Protocol, including how to carry over unused emission credits of economies in transition into the second phase of the Protocol. 2) To plan the work under the Durban Platform Given that much more effort will be needed to cut emissions than is captured under the many existing national pledges to cut and limit emissions, governments decided last year in Durban to reach a universal climate change agreement covering all countries from 2020, to be adopted by 2015, and to find concrete ways before 2020 to increase efforts beyond the existing pledges. In Doha, their objective is to plan the work so that: a) this task is delivered and the timetable is met. b) different national circumstances are addressed in an effective, fair, ambitious agreement. 3) To complete the Bali Action Plan Governments decided in Durban at the end of last year to complete the 2007 Bali Action Plan, covering the areas of mitigation (curbing greenhouse gas emissions), adaptation to climate change, and the finance, technology and capacity-building which developing countries require to build their lowemission, climate-resilient futures. In Doha, governments need to decide which elements of the Bali Action Plan have been achieved and/or implemented, what additional decisions can be taken in Doha and which elements may need to continue to be further addressed. 4) To complete new infrastructure and chart the way forward on long-term climate finance Governments are presently completing the new infrastructure to channel technology and finance to developing nations and have agreed to move toward the full implementation of this infrastructure and support in Doha. This includes: a) endorsing the decision on the location of the Green Climate Fund and the work plan of the newly established Standing Committee on Finance. b) formally deciding on the location and mode of operation of the Technology Mechanism s Climate Technology Center and Network. 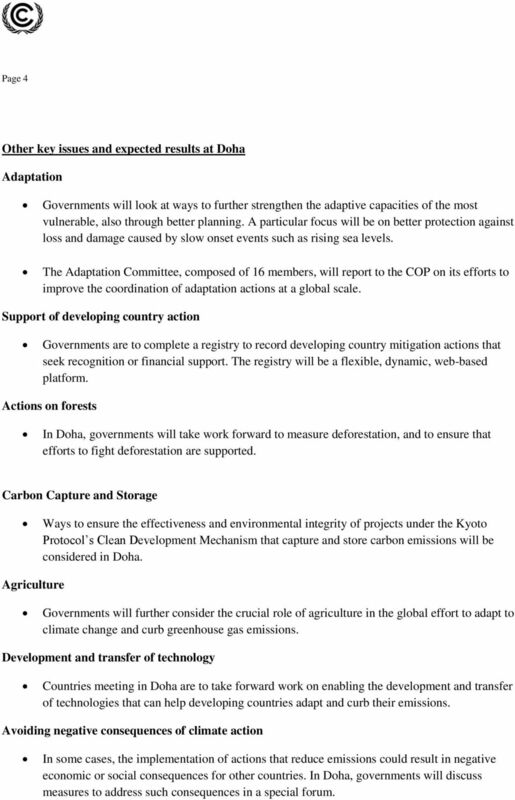 4 Page 4 Other key issues and expected results at Doha Adaptation Governments will look at ways to further strengthen the adaptive capacities of the most vulnerable, also through better planning. A particular focus will be on better protection against loss and damage caused by slow onset events such as rising sea levels. The Adaptation Committee, composed of 16 members, will report to the COP on its efforts to improve the coordination of adaptation actions at a global scale. Support of developing country action Governments are to complete a registry to record developing country mitigation actions that seek recognition or financial support. The registry will be a flexible, dynamic, web-based platform. Actions on forests In Doha, governments will take work forward to measure deforestation, and to ensure that efforts to fight deforestation are supported. Carbon Capture and Storage Ways to ensure the effectiveness and environmental integrity of projects under the Kyoto Protocol s Clean Development Mechanism that capture and store carbon emissions will be considered in Doha. Agriculture Governments will further consider the crucial role of agriculture in the global effort to adapt to climate change and curb greenhouse gas emissions. Development and transfer of technology Countries meeting in Doha are to take forward work on enabling the development and transfer of technologies that can help developing countries adapt and curb their emissions. Avoiding negative consequences of climate action In some cases, the implementation of actions that reduce emissions could result in negative economic or social consequences for other countries. In Doha, governments will discuss measures to address such consequences in a special forum.